« The Regent Pub: Pizza! You don’t need to travel to Italy very often to know that there’s a lot of deliciousness to be had there. The trick, though, is that like any other country, Italy has its share of really mediocre restaurants, and as a non-Italian speaker, I’m always challenged to find the restos that hit all the sweet spots for food, decor and service. Icing on the cake is that the other diners in the restaurant aren’t foreign tourists, like me (ahh, the selfish “I’m a tourist who doesn’t want to be with other tourists” paradox). Carrying out my usual eating-on-vacation due diligence, I consulted friends who’d eaten in Tuscany in the past year, googled recent blog posts, scanned the New York Times, and waded through Chowhound boards and Slow Travel opinions. The latter two resources are great for up-to-the-minute tips, but the obvious downside is that I have a hard time deciding whose opinion to trust. 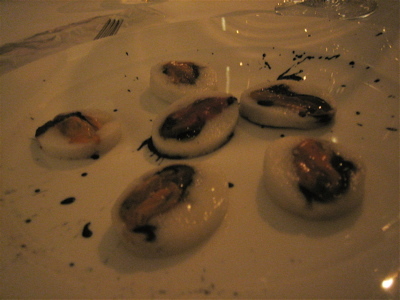 After all that info-gathering, the “fancy” meal I most anticipated was dinner at Il Canto in Siena. The September 2007 issue of Food and Wine magazine annointed Il Canto’s chef, Paolo Lopriore, one of the “top 5 chefs in Italy.” While rankings like these are suspect and never exclusive, I did some cross-checking on Chowhound and Slow Travel, and all voices agreed that the food at Il Canto would be classic, but with a twist (i.e., weird but not too weird). 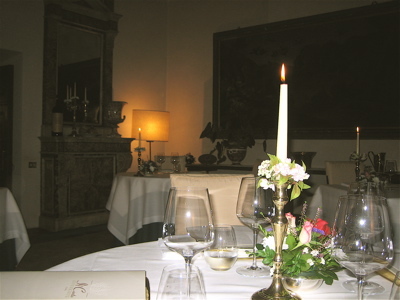 Il Canto is part of a pretty Relais & Chateaux property, Hotel Certosa di Maggiano. We had quite an adventure finding it, because it’s on the outskirts of Siena, reached only after driving through winding, high-walled roads. Thank goodness we had cell phones and that the hotel staff were friendly and great at giving directions on the fly. The upside of Il Canto’s location is that I felt like we were in the countryside, and it was easy to enjoy the romance of the hotel’s open-air courtyard. The dining room is chandelier-big-flowers-thick-carpet formal, but it’s saved from a high-intimidation factor by the oddly frumpy flowery plates displayed on the sideboard and the crocheted doilies on the chargers. I think Il Canto is what your grandma’s house would like if grandma lived in a medieval Tuscan cloister renovated for modern style circa 1800. I started the evening festivities with my by-now-familiar dance with the waiters to try to get tap water. No can do. Bottled water only. Sheesh. Grissini came out, and they were crispy and olive oil-y, but served in cellophane. Between the cellophane and the doilies, I couldn’t tell what tone the restaurant was trying to strike. Our group decided against the 100-euro tasting menu (170 euro with wine pairings) because there were too many things on it that sounded unappealing and too many tasty-sounding items on the a la carte menu only. A la carte, my mussels appetizer was so-so, looking like single-celled organisms (pre-historic times being one of those really gourmet eras, I hear) and tasting like oysters. I’m a fan of ye olde briney oysters, but then why not offer oysters instead of dressed-up mussels? Jon and Kate both ordered squid starters that were a little bit too “creature of the sea” for me. 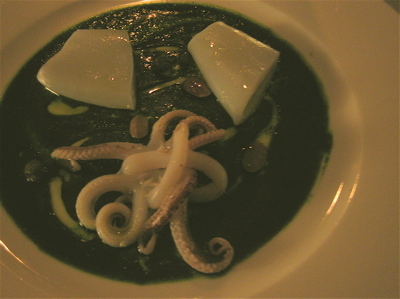 The squid was fresh and sweet, but it was served in all its tentacled glory in an intensely-green seaweed sauce. Not the most enchanting, appetizing vision. My gnocchi were shaped like ravioli but tasted pillowy-soft with a dash of lemon zest and a pleasantly surprising crunch of fried cumin. Still, though, why make the gnocchi look like ravioli? Why not just have the gnocchi look like, you know, gnocchi? Much as I mock, this course was the most playful and yummy of the bunch, I think. 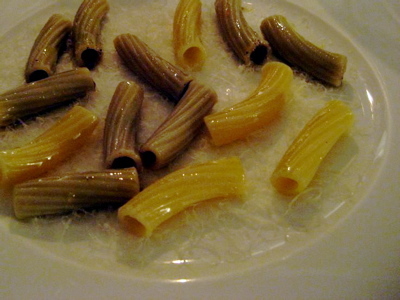 Jon had ordered the chef’s famous cacio e pepe rigatoni, and it was clever, but it didn’t seem to change the taste much to have the black pepper-and-cheese flavor locked into a gelee that was piped into individual rigatoni. (Jon is standing over my shoulder right now and insists that I note that only half the rigatoni were filled with gelee. The other half were just empty, plain rigatoni. He was unamused). My pigeon secondi was a total winner. Rich and meaty, like the best liver and duck you’ve ever had, combined. The dish’s bittersweet rhubarb compote balanced out the pigeon’s meatiness. (How disturbing is it that I am a big fan of eating pigeon, our friendly rats of the sky)? Unbelievably, I still had room for dessert, and my puff pastry with coffee ice cream was totally not worth 16 euros. It tasted of lemon zest. I’d prefer that it taste of sweet cream. 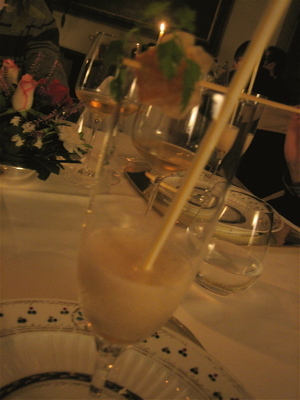 The amuse-bouches were tons of fun – the strongest part of the meal, really – especially a heavy-duty amoretto foam and pumpkin tempura on a skewer. The straw and the skewer were playful touches, and the sweet, nutty amoretto fumes lightened up the hot, fried goodness of the pumpkin. It was tasty, creative. In short, it worked. The amuses at the beginning of our meal were fun, too. 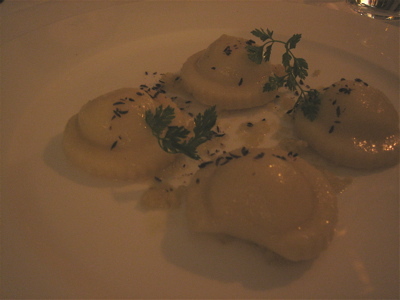 Eggplant with parmesan; sardines with pecorino; apples and pecorino; tuna and “steamed bun” with mayo. Dehydrated vegetables on a lollipop stick were also surprisingly delish and entertaining, the highlight being the red onion pops. Continuing the trend of strong fun bits, the petits fours were a riot of colors and childhood memories. Lots more candies and cookies on skewers, basically. I was both especially freaked out and drawn to the chocolate-covered strawberry that had been sliced through and put on a stick so that the strawberry cross section looked to me like a giant red eye peeking out from a hood of chocolate. Its gruesome appearance makes it the ultimate Halloween snack, and it even tasted good. Antipasti, primi, secondi and cheese, desserts, coffees and wines totaled just over 110 euros a person. The company was unbeatable, but I don’t think I’d go back. 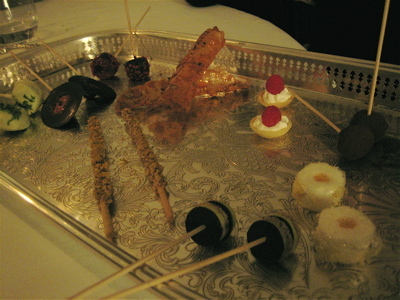 The food had its moments of genius and delight in the amuses and petits fours, but not enough to pay $150 a person for. For your one-Michelin star choice in the area, perhaps stick with Gallopappa, which Kate and Ray raved about for days afterward! on November 13, 2007 at 9:19 am | Reply Andy M.
The mussel appetizer, not so appealing. You had to travel all the way to Italy just to get something that looks like jellied eels. Still, looks like a fun place with some creative cuisine, even if only half of the rigatoni were filled! We’ll be in Siena during Christmas week – want to share any hidden gems?